Living Desert Adventures: departure: From your overnight accommodation in Swakopmund, at 8:30 in the morning. Duration: The tour lasts approximately 4-5 hours. Our journey begins in Swakopmund and leads us across the Swakop River towards the local dune belt between Walvis Bay and Swakopmund. This dune belt is about 30km long and 5km wide and supports an impressive wealth of fauna and flora. Establishment slowly drive along the foot of the dunes, taking precaution not to drive on the gravel plains and cause any unnecessary damage to the environment. The gravel plains are protected and home to nesting Damara Terns, which are endemic to this area. Driving along gravel plains leaves scars, which can take up to 100 years to recover. Conservation issues and the geological structure of the desert will be discussed in detail en route. Plenty of time is available for frequent stops to take photos of the dunes and the surrounding environment. Your guide will stop continuously to look for tracks (known locally as reading the bushman paper), to determine which animals were active the night before and wherever possible will try to catch some of them to show you. Great care is taken in sharing knowledge with you on each desert animal, including emphasis on special adaptations and perfect design used for survival in the desert. Time and care is taken to ensure each animal is returned safely to its home. Establishment cross the dune belt from East to West in a 4x4 vehicle, lending opportunity to incredible views of the desert landscape and an adrenalin packed journey where experienced knowledge of sand driving is essential. Enjoy a tea and coffee break on top of the dunes overlooking spectacular scenery packed with emotion and beauty. 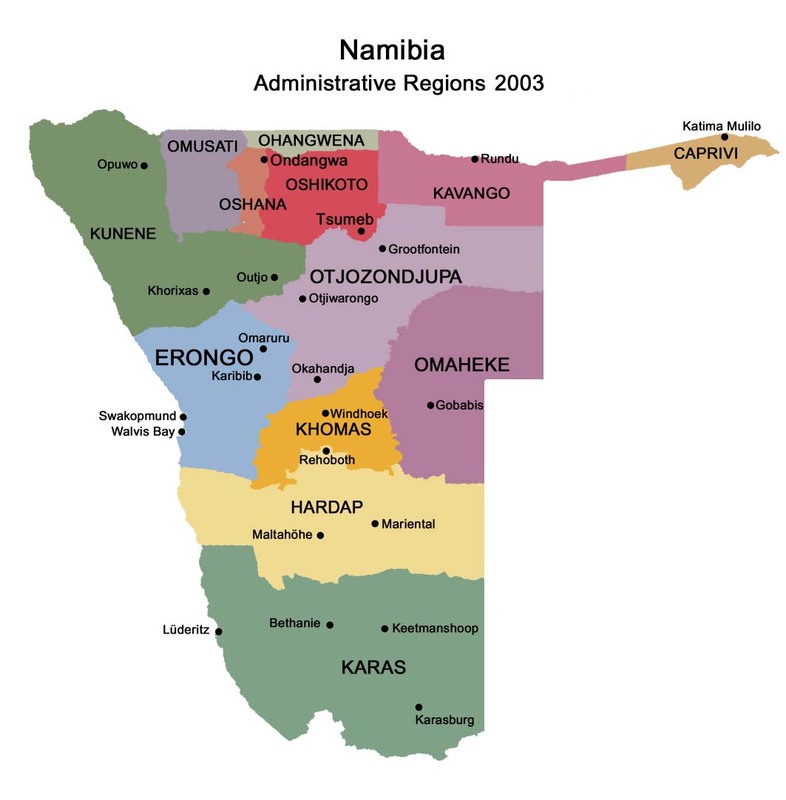 THE NAMIB DESERT: The Namib Desert is approximately 2000 km long, extending along the entire coastline of Namibia from northern South Africa into southern Angola. It is the oldest Desert in the World, dated between 2 and 40 million years of age. The Namib is recognised as a desert because of its low rainfall and high evaporation rates. Rainfall varies from 15mm a year along the western coast, to 100mm a year along the eastern boundary. Evaporation is around 3500mm per year. 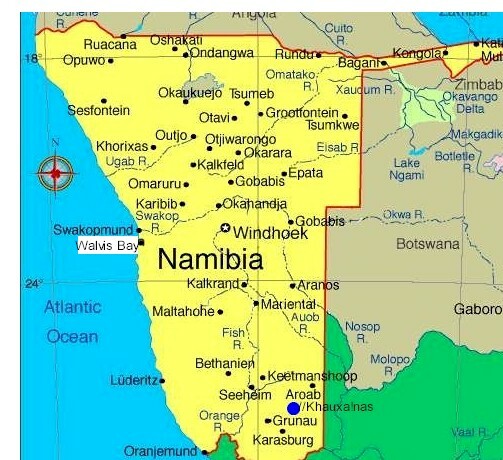 Two factors influence the Namib Desert, namely: cold ocean currents and high air-pressure zones. COLD OCEAN CURRENTS: The cold Benguela current, which originates in the Antarctic, flows northwards towards the equator along the Namibian coast. The cold water cools the sea down and decreases evaporation from the surface, reducing atmospheric moisture that is available for rain. HIGH PRESSURE ZONES: The majority of the worlds deserts are found north and south of the equator at latitudes approximately 30degree south (Namib and Kalahari) and 30 degree north (Sahara). Air masses that have lost their moisture are moved to the poles by antitrade winds. As the air cools, it becomes heavier, and descends. The descending air becomes compressed which increases in temperature and creates a high-pressure zone. High pressure prevents moist air from flowing into these zones, thus suppressing rain. The Namib Desert is unique, because it experiences fog along the western perimeter for more than half the year, which in turn supports an incredible amount of Fauna and Flora, of which a large percentage is endemic. LIFE IN THE DESERT: Host journey through the desert will be focused on trying to find all the life organisms featured below, by skilfully tracking and reading the signs of the wild. NOTE – these are all wild creatures and on certain days, fewer are to be found. It’s not a zoo, therefore establishment cannot guarantee what will be found, but establishment will certainly do host best to show you all there is to see. Life in the desert is concentrated on the dune slip face where 99% of all desert dwelling animals live, comprising mostly of reptiles and insects, of which a large percentage are endemic to this area. The windward side of the dune has a gradual slope of 14 degrees, while the leeward side of the dune has a slip face with a steeper gradient of 34 degrees. It’s along the slip face that wind blown detritus (seeds, plant material, dead insects) is found, and along with that the beginning of the food chain. The Namaqua Chameleon is one of 2 Chameleons found in Namibia and is by far the more aggressive of the two. When approached it opens its huge yellow mouth and makes a wild hissing sound to frighten enemies away. It is normally a dark black colour in the morning to absorb heat, and can be found turning a paler colour in the afternoon to radiate heat. This Chameleon has an enormous appetite and will eat almost anything it can fit in its mouth, including beetles, crickets, lizards and even snakes. The tongue is as long as the body with a suction cup fitted at the end. When feeding the tongue is cast out, much like a fishing rod is used to cast out a line. A hard bone having a wishbone structure is used to cast out the tongue – truly amazing. It has a gland on its nose to get rid of excess salt, caused by living in a coastal location. Water is absorbed through what it eats, especially tenebrionid beetles, which generally have a high moisture content through fog absorption. The dune cricket, which is nocturnal in nature, displays marvellous design with antennae 3 to 5 times the length of its body and has spiky projections on it’s feet. Among the insects, the dune cricket, from the genus comicus, displays an extreme modification of feet for sand walking. Along the length of the hind feet in particular, there are a number of finger/leaf - like projections, from which stiff hairs protrude to form a structure which functions like a snowshoe. These highly specialised structures greatly increase the surface area of the feet, thus increasing the speed and ease with which the cricket can move over the sand. 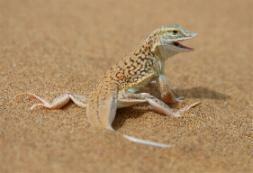 Considering they are prime prey for lizards, geckos and snakes, they do well to have a fast get away. We look forward to sharing the secret treasures of the desert with you. Your guide will take you on an action packed journey over the dunes displaying experienced 4x4 driving skills. Driving over the dunes in a responsible manner affords excellent landscapes, and great photographic opportunities. Come experience the sand lions of the Namib Desert - have fun climbing up the slip-face of a dune and hear how it roars while sliding back down. On the route back, establishment take a short visit to a world war one horse graveyard (circa 1914). Here over 1600 horses and 800 mules were shot and buried, due to an outbreak of the animal disease Glandus. Shifting sands, moved by strong winds, open and close these graveyards at random, exposing the weathered bones. Living Desert Tour: An exciting educational tour that explores the local dunes between Swakopmund and Walvis Bay, and the abundance of life therein. Geckos, rolling spiders, scorpions, lizards, snakes, chameleons and skinks are some creatures to be found on this exciting tour. Welwitschia Moon Landscape Tour: This tour takes us eastwards from Swakopmund into the Namib Desert along the banks of the Swakop River. The River has carved out deep canyons into the granite rock, producing spectacular landscapes known as the Moon landscape. This tour focuses on geology, desert adapted plant life (oldest living plant Welwitschia Mirabilis), animals big and small and vast landscapes. Desert Extravaganza: A full day desert experience covering all aspects of the desert landscapes in and around Swakopmund. From the rolling sand dunes with its secret treasures to the granite rocks and fascinating plants of the moon landscape, this tour combines the Living Desert tour in the morning with the moon landscape in the afternoon. Presented in a professional manner with a wealth of knowledge. Sandwich Harbour Tour: Sandwich harbour was named after Lord Sandwich, and played an important role in the history of the West Coast of Namibia. It was used to smuggle ammunition to the inland, scrape guano, and today is a very popular tourist attraction, being a very important wetland for birds on the coast of Namibia. Establishment travel to the Walvis Bay lagoon, the salt works, along the coastline through heavy sands to Sandwich Lagoon for a day of bird watching, sight-seeing, huge dunes, open beaches and plenty of fresh air. Cape Cross Tour: In 1486, Diego Cao landed at the coast of Namibia and erected a cross at the location, which is now known as Cape Cross. Cape Cross is situated 115km north of Swakopmund, and today a replica of Diego Cao’s cross can be seen there. Cape Cross is well known for its large seal colony, which varies between 80, 000 to100, 000 in number. 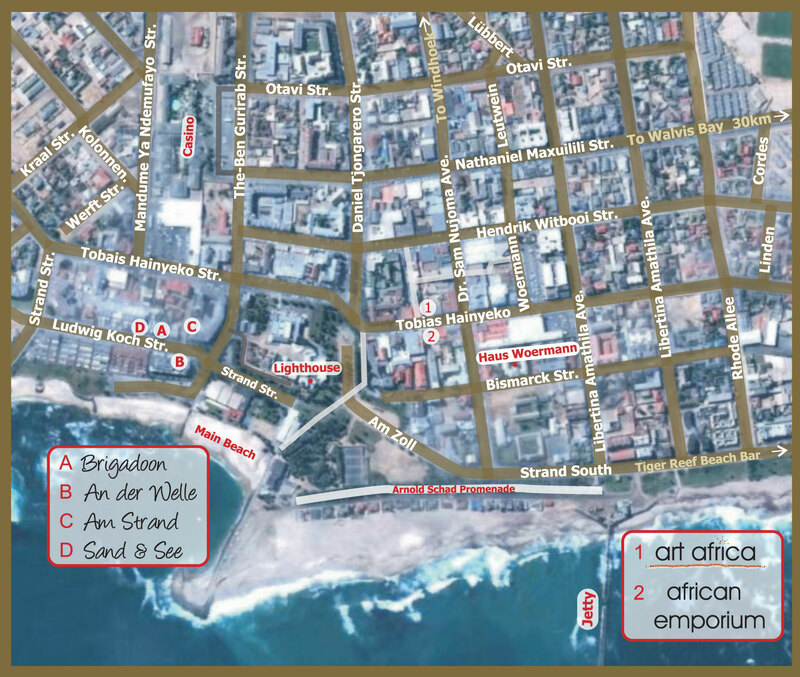 A visit to the mile 6 salt mine and lagoon, and Henties Bay is included. Tailor made Tours: Tours designed to suit your needs from 1 day to as many as required. Establishment specialise in exclusive tours exploring the wildest untouched places in Namibia while offering excellent service with professional guides. Establishment offer wild camping to explore remote areas, otherwise lodging safaris to suit your needs or a combination of lodging and camping. Prices are supplied on request. Living Desert Adventure: An exciting educational tour that explores the local dunes between Swakopmund and Walvis Bay, and the abundance of life therein. Geckos, rolling spiders, scorpions, lizards, snakes, chameleons and skinks are some creatures to be found on this exciting tour. Welwitschia Moon landscape Tour: This tour takes us eastwards from Swakopmund into the Namib Desert along the banks of the Swakop River. The River has carved out deep canyons into the granite rock, producing spectacular landscapes known as the Moon landscape. This tour focuses on geology, desert adapted plant life (oldest living plant Welwitschia mirabilis), and animals big and small including vast landscapes. Tailor made Tours: Tours designed to suit your needs from 1 day to as many as required. Operator specialises in exclusive tours exploring the wildest untouched places in Namibia while offering excellent service with professional guides. They also offer wild camping to explore remote areas, otherwise lodging safaris to suit your needs or a combination of lodging and camping. Prices are supplied on request.